It’s no secret I’ve never truly seen the attraction to a PC that is essentially just a web browser; my last Chromebook was used once in a blue moon to browse the web and little more before being sold. 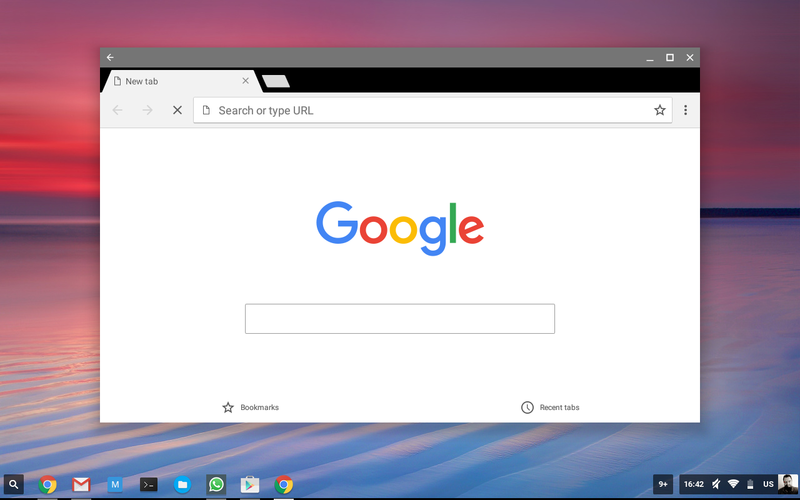 On the announcement Android apps were officially coming to ChromeOS I knew my perception would change and I was absolutely right. Now the Android update has been running on my Chromebook for a little while, I’ve spent some time going through my list of frequently used apps to determine how I can improve my Chromebook experience. Here’s a list of the first notable 5 apps I use frequently. Google Photos is great as it provides simple, direct access to all photos uploaded from all of my devices. It’s easy therefore to upload, download and share whatever I want directly from the Chromebook rather than utilising the Photos website. As a bonus I can set my screenshots to automatically upload by allowing Photos to monitor the downloads folder, making them available on all devices shortly after I take them; very useful for when I take screenshots on the Chromebook while I’m writing about it using my desktop. Like now. This functionality was to a degree there already since all my photos are available in Drive, but the experience is different and not any where near as pleasant as using the Photos app. My reliance on Office has never truly disappeared. I blame it on every company I’ve worked for requiring I use Office, corporate templates, and definitely not Google Docs because it’s not an authorised storage area for corporate documentation (fair enough). Office 365 and Office Online is fine for what it is, but it’s not at all comparable to native applications. 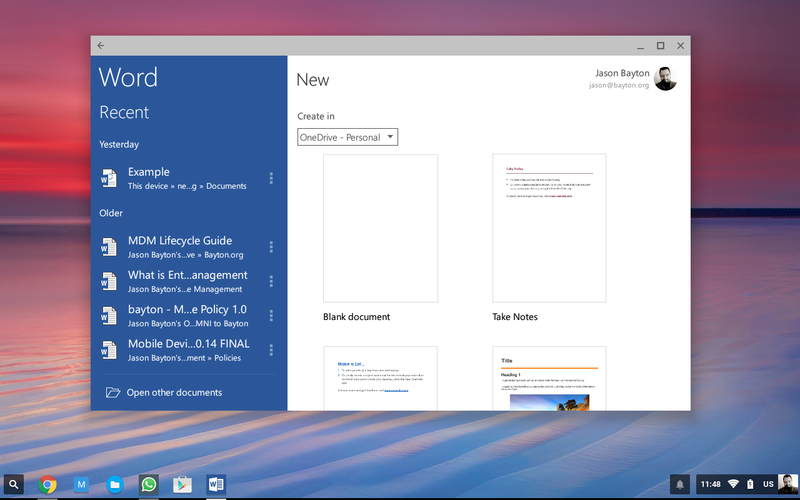 The Android app certainly isn’t as feature-rich as desktop counterparts, but it makes working with office documents that much better than the alternatives. Word hooks directly into my 365 account and allows me to edit documentation without having to switch to another PC. There are occasionally formatting issues, but they’re not as bad as what I see using Office Online. Definitely the lesser of two evils and I begrudgingly admit I somewhat enjoy being able to use a MS app on the Chromebook. Back in the day, Chrome OS provided a relatively OK SSH client through Crosh, the Chrome OS terminal (Ctrl + Alt + T if you’ve never seen it and are using a Chromebook to read this now). Then for reasons unknown by me they dumped it and requested everyone install Secure Shell to re-enable the functionality. If I have to install an SSH client, I may as well install one I enjoy using on my other devices: JuiceSSH. Other than it being very customisable, it has features such as CloudSync (pro licence) keeping SSH endpoints synchronised between all signed-in clients, snippet support for providing easy access to saved commands and plugin support to further extend functionality as required. 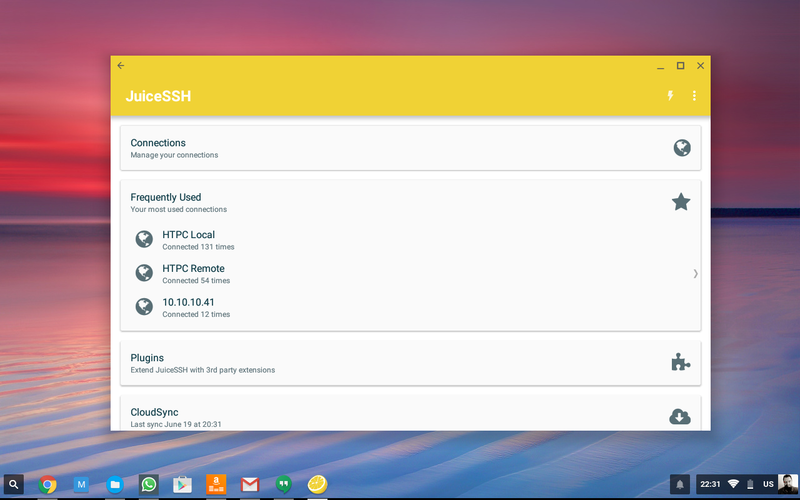 I’ve been using JuiceSSH for a couple of years and recommend it for anyone looking for an Android SSH app. Beyond the corporate stuff in Office 365 and some data I keep in Drive, Nextcloud hosts everything else I have on my own home servers. 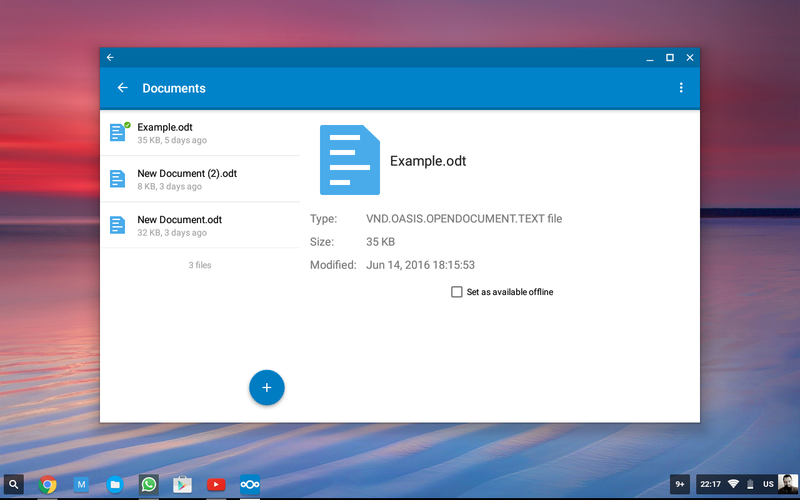 Nextcloud is a recent fork of ownCloud that’s already quickly becoming the newer, better and faster-developed alternative to the ownCloud of old. If you’re an ownCloud user and have ever been frustrated by the dual licenses, the paid vs free model and – as part of it – lack of some of the better features, Nextcloud have gone completely FOSS following the Red Hat model of charging for enterprise support rather than enterprise features. 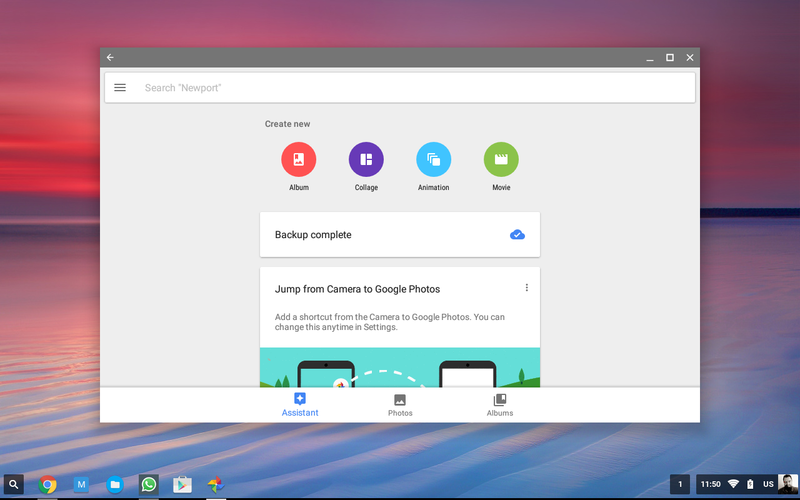 Chrome OS has an app in the webstore called Network File Share that’s recently been released to provide access to network shares and it works fine – the added shares all show up as new paths on the right-hand side menu in the files app – but like Photos and Drive, it’s not the same as having a dedicated app utilising an interface designed to compliment the solution whether inside the network or accessing remotely. The Nextcloud app allows for quick, simple access to my private datastore from anywhere, and makes it super easy to upload, download, edit and share data with a few clicks. A definite nice to have; I’m somewhat used to accessing mail direct from my device rather than through a web browser. 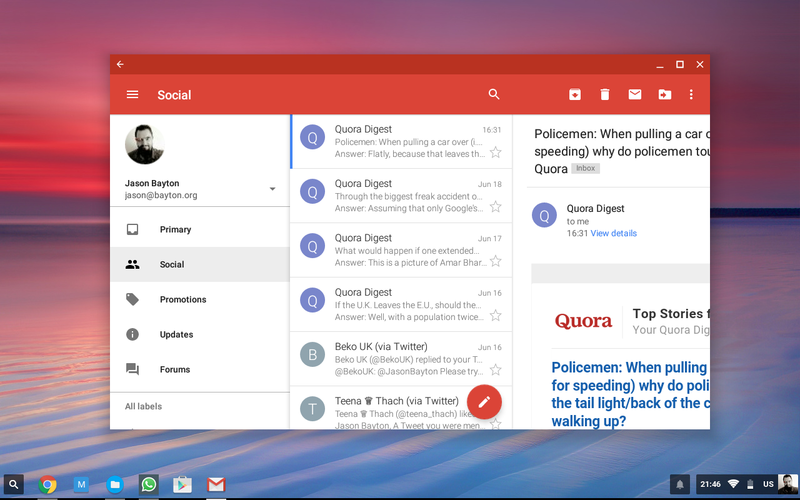 Gmail works pretty well, although it’s a lot slower to sync on the Chromebook than pretty much anything else I have it installed on. I put this down perhaps to sync settings, though unlike a normal Android device it’s not seemingly possible to get into the guts of sync settings to make changes. Perhaps that’ll change with an update. This is just a small list of the apps I’ve found that add to my Chromebook experience and I’m working to find more as I go along. Unfortunately not everything seems to run quite right at the moment, with the two big ones I’m missing being TeamViewer as the app crashes the Chromebook entirely and Sonos as the way the Android container is networked is not allowing it to scan my LAN for my speaker system. 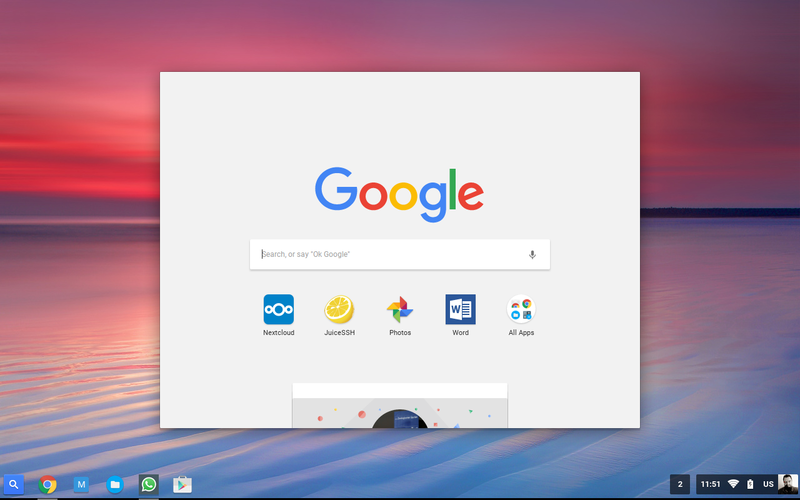 Regardless of how trivial it may seem to be able to do something via an app rather than going through a web interface, it all adds up to what feels more like a conventional “desktop” experience and less cloud-based; one of the biggest things I’ve disliked about Chromebooks to date. Have you gotten the Android update for your Chromebook? What are your go-to apps? Let me know in the comments or tweet me @jasonbayton. In your screen shots all the apps are in Windows. I tried juice ssh and mine always seems to be full screen, is there an app or developer setting you are using?